Reprinted with permission from the Michigan Catholic newspaper. Written by Dan Meloy. Originally published on Feb. 8, 2018. To read the story on the Michigan Catholic website, click here. Kalamazoo — Justin Black has been in the foster care system since he was 9. He’s been with Catholic Charities of Southeast Michigan since he was 12. He’s had more than 20 case workers. Not every worker sticks out. But the ones who do, do so because they’ve offered Black, and those in his situation, something they desperately need: stability and care. Black, a Detroit native, is a year removed from “aging out” of Catholic Charities of Southeast Michigan’s foster care program. Black now studies at Western Michigan University after graduating from Southfield High School in 2015. During his time at Western, Black has had the chance to travel to Europe and Asia and is involved with the Seita Scholars Program, which provides him with a coach to guide him through college life. Black is a testament to how foster families can have an impact on a person. He became affiliated with Catholic Charities’ program after his case was referred to the agency by the Michigan Department of Health and Human Services. Black moved from home to home, agency to agency most his adolescence. He was 15 and living at a friend’s house in Detroit and preparing to move to into his new foster home, his paternal aunt’s home in Southfield, when he met Hardin. Black moved out of Detroit and into his aunt’s Southfield home, where he received constant check-ins from Hardin and other workers from Catholic Charities. 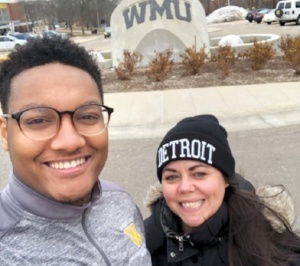 Black’s transition to Western Michigan was made easier because of his new case worker, Kori Vaive, who first met Black during his freshman year. Case workers such as Vaive have helped Black transition to college life, being available for a phone call when advice is needed or just a friendly voice to talk to. While case workers can help, it’s foster parents whose primary goal should be to build that source of stability — regardless of what the child’s future might hold, Hardin said. Harden is up front with potential foster families about the realities of foster care, letting them know if they are looking to adopt, being a foster parent isn’t necessarily the route to take. Still, she stresses, foster parents can make a world of difference in a child’s life. In an ideal world, foster children are returned to their birth families, with the foster and birth families having an amicable relationship based on what’s best for the child. There really is no such thing as a “typical foster family,” Hardin said. Foster parents range from empty-nesters to single people to couples who can’t have children. Regardless of the reason a child ends up in foster care, compassionate case workers and role models playing an active role in a young person’s life can yield positive results, as Black readily admits. Black, who is majoring in public relations with a minor in journalism and a focus on ethnic relations, would like to one day tell the stories of kids who grew up in situations like his. “I’d like people to know that when foster youth get out of a toxic environment, it changes everything,” Black said. “To get them around positive people, those positive people will work off of them. That positivity can be contagious.